ZP35D rotary tablet press is a double-pressure automatic rotary, continuous tablet press machine, pressing granular materials into tablets. 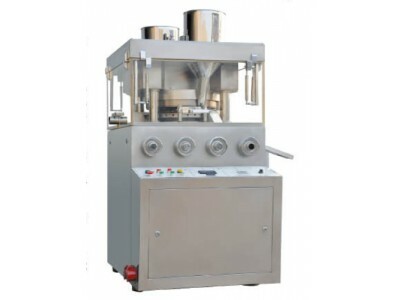 ZP35D rotary tablet press is mainly used for tablet production in pharmaceutical industry, and is also applicable to chemical, foodstuff, electronics and other industrial sectors. 1. ZPS35D Rotary Tablet Press is a double pressure and continuous automatic tablet press, pressing granular raw materials into tablets. ZPS35D Rotary Tablet Press is mainly used in pharmaceutical industry and other industrial sectors, such as chemical, foodstuff, electronics and so on. ZPS35D Rotary Tablet Press can produce tablets in rounded and irregular shapes. 2. With doors and windows made of transparent glass, the condition of the pressing process can be observed clearly. The side panel can be opened totally, making it easy to clean and maintain the tablet press. 3. The external tablet press is fully enclosed, made of stainless steel materials. The internal table is also made of stainless steel materials, which can keep the surface shiny and prevent cross-contamination, in line with the requirements of GMP. 4. All the controllers and operating parts are reasonably arranged. 5. Frequency control device is used to make it safe and convenient to operate ZPS35D Rotary Tablet Press. 6. An overload protection unit is equipped in the system to avoid the damage to ZPS35D Tablet Press and the moulds. When overload occurs, the rotary tablet press will stop automatically. 7. The mechatronics has been achieved. 8. The transmission system is installed inside the tank below the tablet press's body, completely isolated to avoid oil pollution. By having the transmission parts immersed in the oil tank, it is easy to keep cool and stand wear and tear. 9. 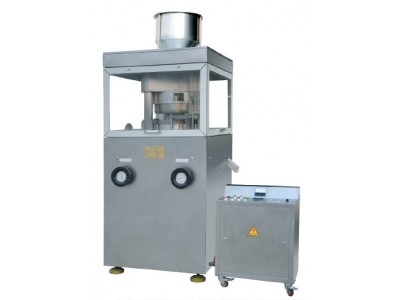 Equipped with a dust collector, ZPS35D Rotary Tablet Press can automatically remove dust. 10. The quick-wear parts, such as track, feeder, hopper and driving worm, have general structure with ZPS33 tablet press. It helps to achieve standardization, generalization and serialization. The moulds are in common use with ZPS19 tablet press, ZPS33 tablet press, ZPS33B tablet press, ZPS35 tablet press, ZPS37 tablet press.